Swami’s is in La Mesa, too! Swami’s, long a part of Encinitas, is also in La Mesa & Oceanside. My coffee buddy and I visited the La Mesa café to sample some of their 11 pumps of coffee. Normally they offer 13 choices of Gavina self-serve coffee, but they were out of 2 choices when we were there. No problem, 11 was enough! We each paid $2, grabbed a mug (hearty ceramic mugs are by the coffee pumps) and proceeded to try at least 6 of the choices (less than half a cup at a time, though). I tried a Northwest dark roast, Mexican organic, Colombian, Costa Rican, French Caramel, Chocolate Raspberry, and Blueberry. I know that’s 7 and I’d said 6, but I pitched the blueberry…it didn’t suit me. I don’t normally go for sweet coffees, but I actually liked the French Caramel and Chocolate Raspberry, although they’d both be better as a dessert coffee. I forgot to try the Hawaiian, so I’ll have to go back. And there are other reasons to go back, like for their banana walnut pancakes (served all day, closing at 9:00pm daily). 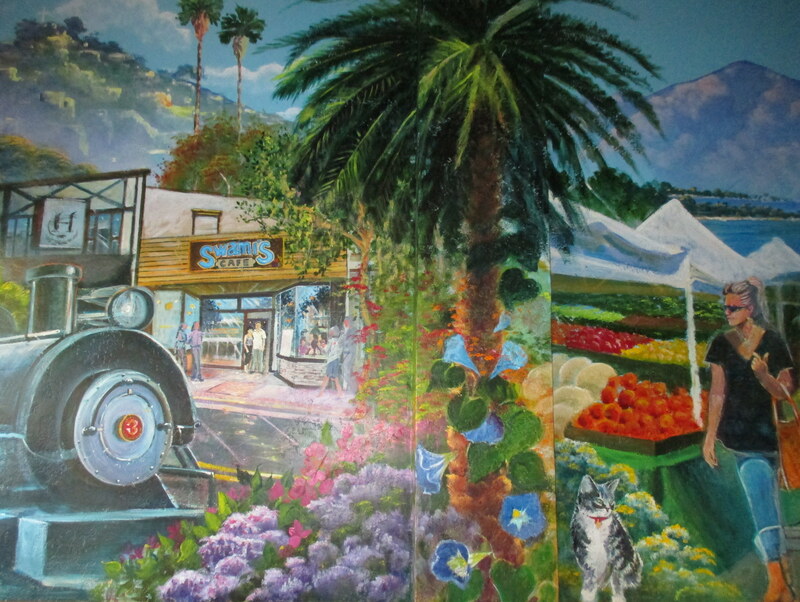 The original Swami’s is in Encinitas at 1163 W. Coast Highway 101. Their Oceanside café is at 608 Mission Ave. I always have a hard time remembering which exit off of I-8 for downtown La Mesa, so in case you do, too, here are my directions: Take the Spring St. exit off the I-8 east bound, veer right & turn left at the light at La Mesa Blvd. There are parking meters in front of Swami’s, but free street parking is a few blocks away. This entry was posted in Coffee shops in East County and tagged 13 coffee pumps, antiques, car show, Christmas, La Mesa, Oktoberfest. Bookmark the permalink.